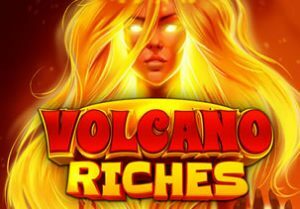 Landing eruptions of coins is the name of the game in Volcano Riches, a Polynesian-themed slot game from Quickspin. It’s a volatile game that comes with volcano wilds that can explode to turn up to 5 adjacent symbols wild as well as a free spins round where even more volcano wilds are in play. Stakes range from between 20p and £100 per spin. The area of the Pacific known as the Ring of Fire is the setting for Volcano Riches. There’s a strong Polynesian feel to the design - you’ll see grass skirts, hollowed out canoes and carved statues spinning around the reels. As usual for a Quickspin slot game, it all looks terrific. The gameplay centres on 2 main extras. Volcano Wild feature - whenever a Volcano Wild symbol lands, it erupts. The flow of lava turns between 2 and 5 adjacent symbols wild too. A new payout consideration is then made with all the extras wilds in position. You can only land a single Volcano Wild on any given base game spin. The eruption could deliver another Volcano Wild though which repeats the process and can deliver a mighty rush of coins. Free Spins Bonus feature - land 3 bonus symbols on the same spin and you’ll receive 10 free spins. Winning combinations during the free spins can be formed from right to left as well as the more usual left to right. Look out for the Volcano Wilds on reels 2 and 4 throughout the feature which trigger the Volcano Wild feature. It’s possible to land 2 Volcano Wilds on any free spin which means you could end up with 10 wilds in play. The only downside here is that you can’t retrigger any more free spins. The extra wilds make up for that though in my opinion. As you’d expect from a slot game where volcanoes feature so heavily, this is a volatile game. Expect spells where you’ll keep on missing. Trigger the Free Spins Bonus feature though and get on a roll with the Volcano Wilds and some explosive results are possible – up to 1,254 times your total stake on each spin/free spin. Quickspin has once again combined top notch sound and visuals with some explosive features to very enjoyable effect. Get lucky with the wilds and the volatile Volcano Riches can live up to its name. If you want explosive wins, Jackpot Giant by Playtech features volcanoes and a life-changing progressive jackpot.